Elmer Sayre from the WAND Foundation (SuSanA partner) has sent us a short documentation about the recent flash flood in Cagayan de Oro City, Philippines and on how the WAND Foundation is supporting the victims/survivors (see attached PDF files). The WAND Foundation is providing ecosan toilets for evacuation centres and has been asked by the Swiss Humanitarian Agency to supply 35 ecosan toilets (UDDTs) for the evacuation centers in Iligan city. 1. The urine diversion toilet bowls and squatting pans look quite costly (are they made of ceramics? ), are these the types you use in emergencies? 2. Do you also provide handwashing facilities along with the toilets? Last Edit: 02 Jan 2012 12:46 by muench. It has been a couple of weeks now since the disaster and since you installed the Ecosan in the evacuation centres - how well have they been functioning? Was it easy to teach the people - who have just lost everything and for whom sanitation is likely a very minor issue - how to use them? Are the toilets able to keep up with the demand? Thanks so much for your kind comment. The portable ecosan toilets that we have installed in the evacuation centers are working very well. There is no other choice and people defecate in the open since the main water system was destroyed. I can say that as an immediate response to major cataclysm, our approach is so far the best, we can deploy and install in a few hours, the system is easy to use, the technology is simple. We also train some of the victims to take care of the toilets and this gives them something to do rather than just lying around. After this problem has subsided I will write a document describing how this is done, how many toilets per number of evacuees, what are the management concerns, waste collection and recycling and so on. We will also extend our technical capacity to build skills of other NGOs and partners. Water, Agroforestry, Nutrition and Development Fdn. a. the toilet bowls shown are made of ceramics. They are donated by Dan Lapid of the CAPS (30 bowls) so I made use of it. The rest are cement-based and made by us. b. handwashing is not provided by us but by others (in big water trucks, since the water system in the affected areas were destroyed). c. gender sensitive in the sense that women have now the dignity to defecate in private, whereas before they did it in the open. thanks for these responses. Please keep us posted about the situation. 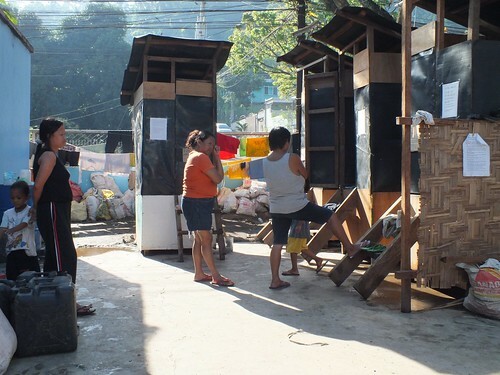 From 54 portable ecosan toilets we installed in evacuation centers and in scattered communities in Cagayan de Oro and Iligan hit by Typhoon Sendong, we were able to add 53 more last week. We formed several small teams composed of expert carpenters, trainers and waste collectors and thus we are able to cover a large area. UN estimate as of January 10 shows 197,480 people living in makeshift shelters while 24,477 are still in various evacuation centers and we are racing against time to prevent the spread of diseases due to open defecation. We continue installing portable ecosan toilets in unserved evacuation centers as well as we are now reaching out to scattered communities where assistance is badly needed and where sanitation is poor. During this time, we can already advance 2 statements; a. the sanitation solution provided by international aid agencies eg. imported water-based portalets is ineffective and instead poses health hazard, b. ecosan toilets are proven to be effective but it is effective only if continuous education and efficient waste management is in place. If we have not done continuous education and waste collection, our effort would have been a failure too.